If someone asked me right now what game he should get for his iPhone or iPad, having in mind that he loves his Xbox360/PS3, I wouldn’t even have to think for a second before recommending Dead Space. Not only because he will most likely be familiar with the franchise, but because it’s one of the most outstanding titles on the App Store right now. It really is that good. 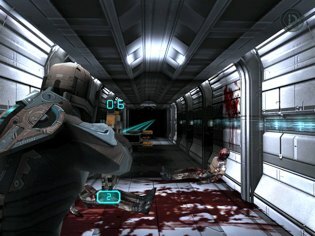 Because of its great visuals, immediately after Dead Space was announced a lot of people started wondering whether you will have full control over the character’s movement, or if it would be an on-rail shooter. After EA dropped the bomb that players will be in full control, iOS gamers got very excited to get their hands on the 3rd person shooter. 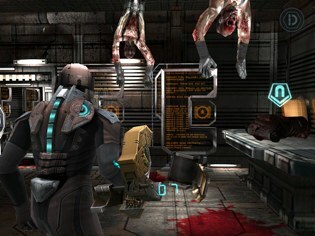 A lot of people loved the original Dead Space back in 2008 and Dead Space for iOS translates almost all gameplay elements to your iPhone and iPad – but with a completely new, stand-alone story that takes place before the events in Dead Space 2. Strategic dismemberment of the disgusting Necromorphs, Stasis, Kinesis, Zero-G, the stomp – it’s all there and it works great. But most importantly, EA succeeded in bringing the tense atmosphere, for which the Dead Space series is famous for, right into the palm of your hands. An important aspect of a 3rd person survival horror game are the controls. And EA has definitely put some thought into the control scheme, it works great. The left side of the screen is dedicated to character movement – basically wherever you touch will be the center of an invisible virtual analog stick. 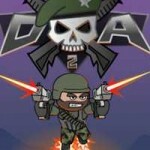 You use the right side of the screen to aim and shoot. If you touch it once you will go into aim mode, touch it again and you will shoot. You can change the orientation of your weapon by either a button underneath the weapon, or by quickly tilting your iDevice. 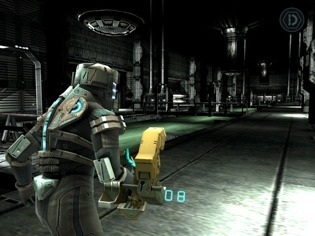 And just like the console versions of Dead Space, EA tried to get rid of as much of the HUD as possible – but due to the touchscreen input, they had to include some of it. The health bar and the ammo count remain the same, but you will need the HUD to change weapons or to access the blue beam that guides you through the levels. 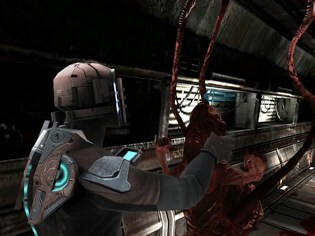 The presentation of Dead Space is impressive. While the mere visual quality can’t quite compete with Infinity Blade, you have to have the fact that you’re in control where to go in mind, which needs more resources than an on-rail concept. 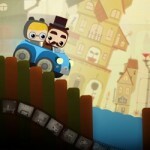 The game is also one of the few to date that takes advantage of the new iPad 2 hardware. 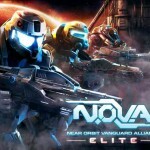 EA has just recently released an update that enhances the visuals even further if played on iPad 2. What also shines is the sound design. The background music combined with some spooky screams every now and then will keep you on your toes. You should definitely play Dead Space with some decent headphones, a lot of effort went into the sound and it contributes a lot to the creepy atmosphere. If you are into the survival horror genre, Dead Space should be an instant pick-up. It’s definitely not for the faint of heart, but if this review got you even remotely excited, check out the trailer below to get an idea of the atmosphere to see if it’s something for you.